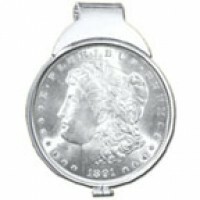 The Morgan Silver Dollar, now one of the most popular coins for U.S. collectors, was first minted in 1878. Melting down of many Morgan dollars took place in the 1960s as a result of rapidly rising silver prices. 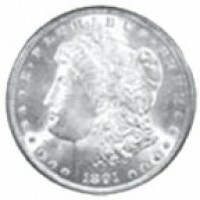 It is estimated that only about 17% of the total number of Morgan Silver Dollars produced survive today. Diameter: Approx. 1 1/2 "
VARIOUS DATES (while supply lasts) Presented in a Presentation & air-tite case ..
Morgan Money Clip Presented in a Velvet Case Various Dates, (while supply lasts) ..